Britain's Prime Minister Theresa May leaves Downing Street to attend parliament in London, Jan. 21, 2019. "This really does feel a bit like Groundhog Day," he said, referring to the 1993 film starring Bill Murray, in which a weatherman is fated to live out the same day over and over again. 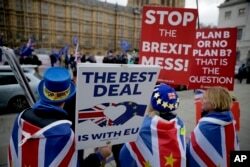 A pro-Brexit leave the European Union supporter demonstrates with placards outside the Houses of Parliament in London, Jan. 21, 2019. Anti-Brexit remain in the European Union supporter Steve Bray, left, holds placards as he demonstrates with others opposite the Houses of Parliament in London, Jan. 21, 2019.